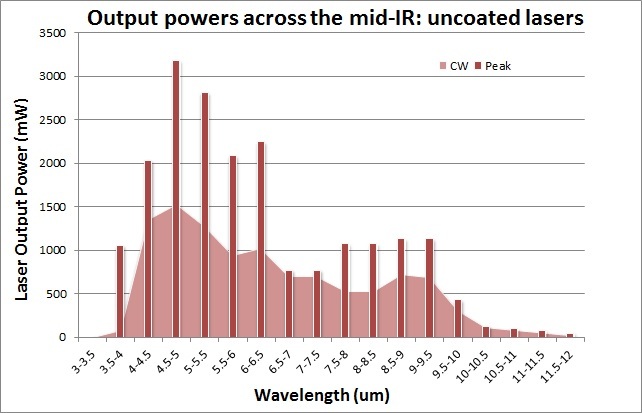 AdTech Optics produces lasers over the whole mid-wave and long-wave infrared (MWIR & LWIR) spectral regions. We offer the most comprehensive selection of quantum cascade lasers optimized for high efficiency, high power output or for medium-power output and low power consumption. Possible uses range from defense and security, to analytical, health and environmental applications. AdTech's QCL products cover almost entirely the wavelength range from 3.8μm to 12.5μm. Most of our devices are capable of continuous room temperature operation and can be fabricated in distributed-feedback (DFB) waveguides for single mode emission or in broad area devices for high power applications. Please refer to our product specs page for examples of lasers specifications. We are continuously updating our inventory and producing new wavelengths! More specific information on all the available products can be requested here.